We're getting reports via Twitter traffic tonight of suspicious wires found in luggage or possibly in the lavatory on Delta Flight 126 at John F. Kennedy Airport in New York. Reports indicate that there's a person being held for questioning by Air Marshals on board the plane with the FBI bomb squad en route. The plane was en route to Madrid when it suddenly turned around around at 40,000 feet and returned to JFK airport in approximately 20 minutes. UPDATE: Probably no big deal. 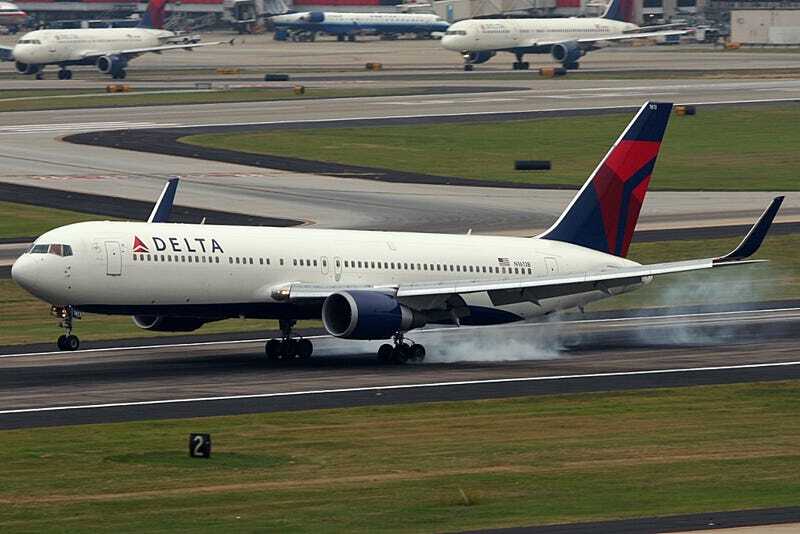 The flight is being reported as Delta Flight 126, a Boeing 767-300ER, which just landed in New York in a flight from Madrid, Spain. Most of the data is coming from police scanners via Twitter at this point. According to FlightAware, the plane was in the air by 8:10 pm. It ascended to 40,000 feet by 8:30 pm. It remained at 40,000 feet, a common cruising altitude for international flights, for half an hour. But at 9 pm, the plane began a rapid descent, dropping from 40,000 feet to less than 10,000 feet by 9:20 pm. At the same time, the plane's speed made a dramatic shift. It had been traveling at a normal clip of about 500 knots, when the speed dropped in minutes to 300 knots. According to Flight Tracker's map, the plane ascended along the Atlantic Coast, and made a fast turn east of Cape Cod to return to JFK. Although the plane at that point was closer to Boston Logan airport, it would not have been able to descend safely and quickly enough from 40,000 feet to get there. As you can see in the graph it diverted course quickly. Delta had no immediate comment.